A new entry into the category “Best New Band that You’ve Never Heard Of” comes to us straight from the Sunset Strip of Los Angeles, California. 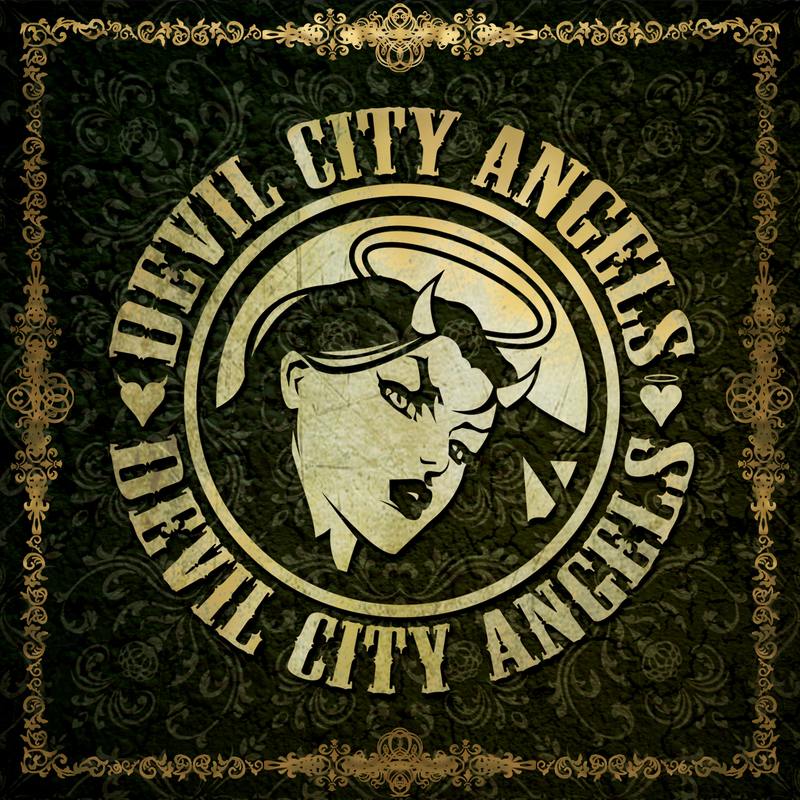 A veritable supergroup of hair metal/sleaze metal pioneers from decades ago, DEVIL CITY ANGELS really deliver some fresh sounding tunes reminiscent of that time of hair spray, decadence and excess (and many times excessive and decadent hair spray). The key element that separates this self-titled effort (September 18 on Century Media Records) from something that you may have already heard from days gone by is the soulful and extremely solid vocals from the relative newcomer of the bunch, Brandon Gibbs (NOT a BEE GEE!). I am usually pretty quick to label a new singer – “he sounds like X”- but I can’t make any comparisons with this guy, previously of GIBBS BROTHERS and CHEAP THRILLS. He is a breath of fresh air and delivers one of the more solid vocal performances that I can recall from a newcomer to this scene. Who is this super group blast from the 80’s past? None other than Tracii Guns (LA GUNS) on lead guitar, Rikki Rockett (POISON) on drums and for this recording, Eric Brittingham (CINDERELLA) on bass guitar. Brittingham has already exited the project and has been replaced by legendary bass player Rudy Sarzo (QUIET RIOT, WHITESNAKE, OZZY). I cannot overstate how important an opening track is on an album- especially from a new band trying to grab the attention of the listening audience. “Numb” is a grabber! A straight ahead rocker with rapid-fire vocals and a little profanity mixed in for good measure. It sets the tone on this record and is one of the best tracks. “All My People”, the first single is a bluesy number that features some old-school washboard percussion, slide guitar and a VERY Steven Tyler-esque bridge chattered by Gibbs followed closely by one of the many tasty Tracii Guns solos found throughout this offering. This song rawks and demonstrates that you are going to get exactly what you expect from a Tracii Guns-related band. “Awww yeah, crank it up!” This begins the intro to “Boneyard”, the first single from the record. A nice song, but very average for this record. “Yo guys, just go with me on this”, Rikki Rockett exclaims to start “I’m Living”. A very catchy albeit redundant chorus carries this song again to the land of mediocrity. There is not a bad song on the disc but this one doesn’t stand out to me. The same goes for “No Angels”. Sporting perhaps one of the better vocals on the record, it’s a good song but not a stand-out. I must be getting soft because the closest thing to a ballad on this record, “Goodbye Forever”, strikes me also as one of the best songs. “How do you say goodbye forever?” This tune beautifully asks that question (although it doesn’t answer the question) and could have easily been on LA GUNS’ Hollywood Vampires from 1991 – it’s got that kind of vibe to it. Another cluster of good but not great songs follows: “Ride With Me” (featuring some of the most aggressive guitar on the release), “All I Need” (also released as a single) and “Back to the Drive.” Musically, lyrically and vocally, these songs are fine, but none of them grab me. This debut from the DEVIL CITY ANGELS finishes strong with one of the highlights of the disc: “Bad Decisions”. “That girl has made up her mind. Good night for bad decisions.” A VERY rocking tune with some zesty riffs that close out this record while leaving you begging for more. While not an instant classic, it is a welcome addition to the contemporary rock scene by a bunch of throwback musicians that know a thing or two about writing hits. Every song on this disc is solid – no bad songs here. STANDOUT TRACKS: “Numb”, “All My People”, “Goodbye Forever”, “Bad Decisions”. Jeff LaBar Talks One For The Road, Touring, And More Solo Stuff! !